This feature enables you to specify the maximum number of checkouts of items by copy location and is an addition to the circulation limit sets. Circulation limit sets refine circulation policies by limiting the number of items that users can check out. Circulation limit sets are linked by name to circulation policies. Click Admin → Local Administration → Circulation Limit Sets. Click New to create a new circulation limit set. 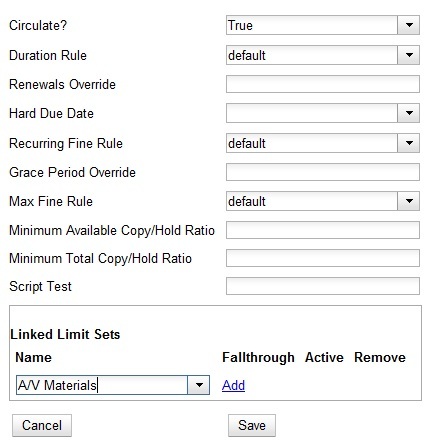 In the Owning Library field, select the library that can create and edit this limit set. Enter a Name for the circulation set. You will select the Name to link the circulation limit set to a circulation policy. Enter the number of Items Out that a user can take from this copy location. Enter the Min Depth, or the minimum depth in the org tree that Evergreen will consider as valid circulation libraries for counting items out. The min depth is based on org unit type depths. For example, if you want the items in all of the circulating libraries in your consortium to be eligible for restriction by this limit set when it is applied to a circulation policy, then enter a zero (0) in this field. Check the box adjacent to Global Flag if you want all of the org units in your consortium to be restricted by this limit set when it is applied to a circulation policy. Otherwise, Evergreen will only apply the limit to the direct ancestors and descendants of the owning library. Enter a brief Description of the circulation limit set. Select an existing circulation policy, or create a new one. Scroll down to the Linked Limit Sets. Select the Name of the limit set that you want to add to the circulation policy.